Aside from pumpkin, butternut squash is one of the more popular vegetables during the fall season. While grocery store aisles won’t be lined with butternut squash everything, there are lots of amazing dishes that utilize this sweet, nutty squash. We’ve picked out nine drool-worthy recipes you must try this Thanksgiving, sure to make everyone in your family a butternut convert. 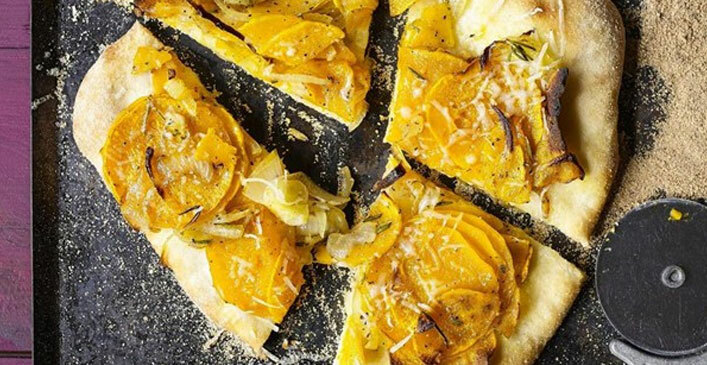 This sauce-less pizza recipe uses half a butternut squash and serves four people, but you could easily use a whole squash to increase the servings. First, the onion and squash are seasoned and baked in a pre-heated oven for 20 minutes at 400 degrees. Pre-made pizza dough is then divided into two and rolled out into 8” pizzas. The squash and onion mixture goes on top covered with Asiago or Parmesan cheese, and is baked at 450 degrees for another 10 minutes. Best served hot for maximum cheesiness.